An Igdir man, identified as A.B., who shared the same cell with people jailed over Gulen links told prosecutors, in an attempt to tap into the effective remorse law, that his cellmates “would not even support Turkish national soccer team” against its rivals. Hurriyet newspaper reported Friday that A.B. was giving his statement under the effective remorse law to be released from prison or get a lower than anticipated punishment. The newspaper did not elaborate on the accusations against A.B. “I shared the same cell with K.G. Him and a group of others would do propaganda on behalf of the Gulen movement. When a good thing happens to be for our country, they would get mad and upset. When there is an economic trouble in the country, they were happy. When our national soccer team had matches with others, they even supported the rivals. They mobilized other inmates as well. They try to maintain their hopes. I saw them blatantly betraying our country,” A.B. told the prosecutor as part of his statement. K.G., a teacher who was jailed over his links to the Gulen movement, said in his defence that A.B. accuses anyone he deems proper. “I filed a libel suit against this person. My family and children were victimized. I don’t have an intention to escape from trial. I seek my release and acquittal,” he said. 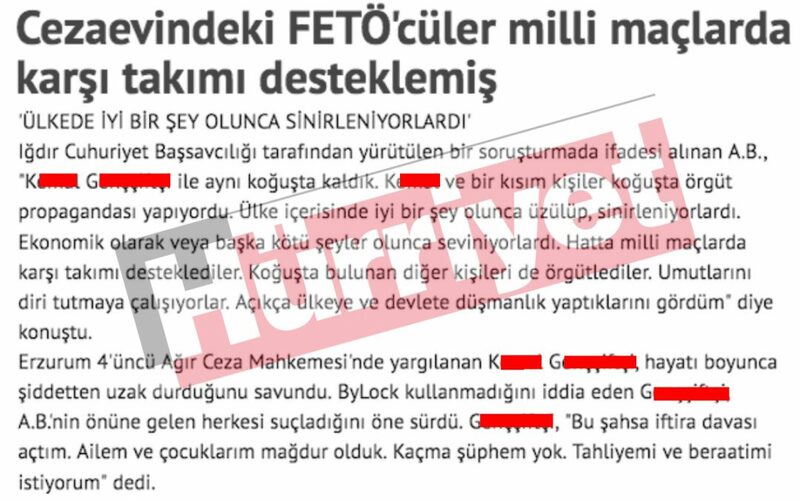 Hurriyet said the court sentenced K.G. to 6 years and 3 months in prison on charges of membership to a terror group, and ruled to keep him behind bars. Turkish government accuses Gulen movement of masterminding the July 15, 2016 failed coup while the latter denies involvement. More than 160,000 people have passed through police custody and 90,000 have been remanded in prison over Gulen links so far.